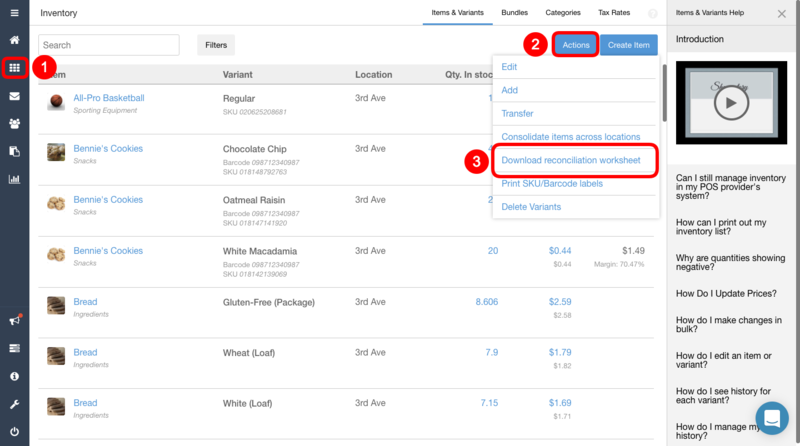 Shopventory offers Reconciliation Worksheets from the Inventory section of Shopventory. This tool allows you to print out your inventory list or download it into a spreadsheet for easy overviews and manual stock counts. To learn how to download a digital spreadsheet which you can edit and re-upload, click here! Or, to see how you can reconcile your product quantities by scanning them, learn more about our Barcode Scanner app here. Simply go to the Inventory section of Shopventory and click on the Actions button at the top of the page. There you'll find the option to download the worksheet. Only one location at a time can be reconciled. For a full export of inventory across all locations, you can download an inventory report from the Reports section of Shopventory. You can select one Category or all to be included in the download. We don't currently offer the option to have more than one Categories selected. 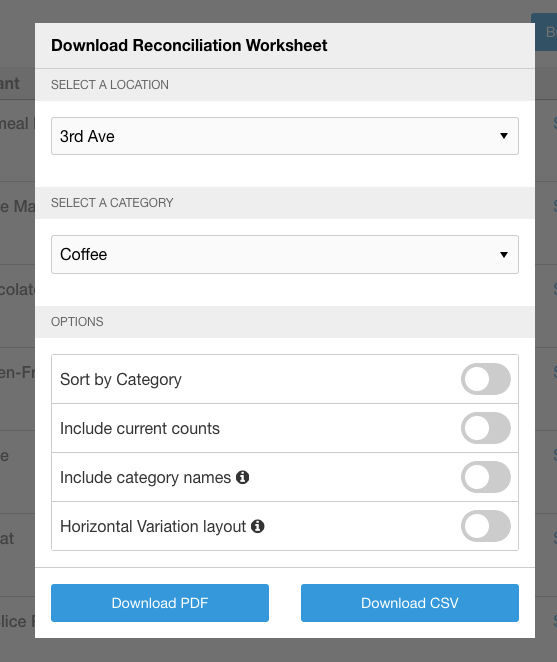 This will sort the sheet by Category if you're not limiting the download to just a single Category. If you are going to print out a worksheet for a manual stock count, we don't recommend including the current quantities as that can bias the person counting. If you are downloading a PDF, this will change the orientation to Landscape (horizontal) rather than the usual Portrait (vertical). The choice is yours! This option will enable the 'Include Current Counts' and 'Include Category Names' options. The download will have all Variants of an Item laid out horizontally--this is especially useful if you have a lot of variants! You have the option to download the Reconciliation Worksheet in the form of a .pdf or a .csv file. PDF files are meant to be easily printed and are in a more easily-readable layout than a spreadsheet. A PDF cannot be edited. CSV files are spreadsheets. They are meant to be used with office software like Microsoft Excel or Numbers. Free alternatives include Google Sheets, Libre Office and Open Office. CSV files are more commonly used for accounting functions, or if catalog information needs to be extracted. You can use the spreadsheet to enter in values for a manual count, if you prefer to use an electronic device like a tablet to write down counts.